This medication is used to treat a certain skin condition (seborrheic dermatitis, a type of dandruff). In this condition, it is believed that a fungus (Malassezia furfur) infects the skin or scalp, resulting in dry, flaky skin (scales) on the scalp, face, ears, chest, or upper back. Ketoconazole is an azole antifungal drug that works by stopping the growth of fungus. Read the Patient Information Leaflet provided by your pharmacist before you start using ketoconazole and each time you get a refill. If you have any questions, consult your doctor or pharmacist. Use this medication on the scalp and skin only. Clean and thoroughly dry the area to be treated. Wash hands before and after applying this medication. Apply it to the affected skin and also to a small amount of the normal skin next to this area, usually once a day or as directed by your doctor. Length of treatment depends on the response to treatment and is usually for 2 weeks. Do not apply this more often than prescribed. Your condition will not clear faster, but side effects may be increased. Do not get this medication in the eyes, nose, or mouth. If this occurs, flush with plenty of water. If irritation occurs, contact your doctor right away. Do not wash the treated area for at least 3 hours after applying this medication. Wait at least 20 minutes before applying makeup or sunscreen to the treated skin. 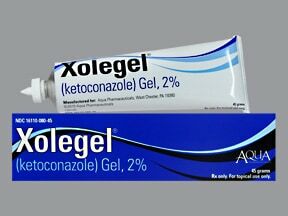 What conditions does Xolegel Gel treat? Burning, redness, or dryness of the treated skin may occur. If any of these effects persist or worsen, tell your doctor or pharmacist promptly. Tell your doctor right away if any of these rare but very serious side effects occur: blisters/open sores on the treated skin, eye swelling. List Xolegel Gel side effects by likelihood and severity. What should I know regarding pregnancy, nursing and administering Xolegel Gel to children or the elderly? Store at room temperature at 77 degrees F (25 degrees C) away from light and moisture. Brief storage between 59-86 degrees F (15-30 degrees C) is permitted. This product is flammable. Do not store or use near an open flame. Do not store in the bathroom. Keep all medicines away from children and pets. Are you taking Xolegel Gel? Are you considering switching to Xolegel Gel? How long have you been taking Xolegel Gel?